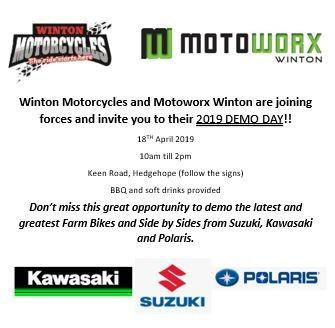 Winton Motorcycles and Motoworx Winton are joining forces and invite you to there 2019 Demo Day!!! Come and try before you buy and get the best bike for you and your farming needs!!! Demo the latest and greatest bikes, side by sides from Suzuki, Kawasaki and Polaris!! A day not to be missed!! !